Targeting its highly affluent TV golf viewers, NBCUniversal is starting an ecommerce market for brands with its Golf Channel, called Shop with Golf. 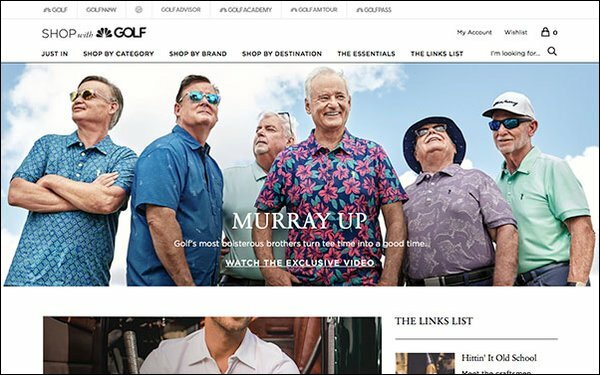 The new website/platform will offer marketers direct-to-consumer access, launching with 30 brands, including Linksoul, J. Lindeberg, Foray Golf, Criquet and Rhone. It also includes performer and golf fanatic Bill Murray and his golf lifestyle brand, William Murray Golf. Other celebrity brands will also be included, such as EleVen by tennis pro Venus Williams. Josh Feldman, executive vice president-head of marketing and advertising creative for NBCUniversal, says the platform is aimed at combining golf fans' favorite brands more directly with golf sports content. Product and service categories include apparel, accessories, beauty, home, wellness and travel. Shop with Golf will also include Golfpass, a new digital membership of NBC Sports Group and golf’s Rory McIlroy, along with golf equipment maker TaylorMade. The membership will offer benefits to play more golf, tools to improve a golfer’s game, high-quality video content and shopping and travel experiences. Over the last year, from March 2018 to March 2019, the Golf Channel pulled in $403.8 million in national TV advertising, according to iSpot.tv. Top brands over that period include: Mercedes-Benz, GolfNow.com, Rolex, U.S. Bank, TaylorMade, Geico, Square Strike Wedge, Ship Sticks, GX-7 Golf, Volunteers of America, Liberty Mutual and Skechers.